Former graduate student in music Jordan Clark has been selected by the Wayne State University Graduate School as the University's nominee for the 2018 MAGS/ProQuest Distinguished Thesis Award. Presented annually by the Midwest Association of Graduate Schools, the award recognizes the best master's thesis across institutions in the region. Ms. Clark's work, "The Power of a Flying Pig: Carl Stalling, Looney Tunes, and America's Need for Escape," was nominated in the Humanities category. She earned her Master of Arts in Music from Wayne State University in May 2017. Ms. Clark's thesis examines the work of Carl Stalling, a composer of music for Warner Brothers' Looney Toons cartoons beginning in 1936. She traces Stalling’s stylistic development in the context of both film music and the changing social and economic conditions in the United States. Through archival research at the University of Wyoming's American Heritage Center, Ms. Clark examined Stalling's compositional sketches, which had never before been studied. In this way, she makes a new, important contribution to the field of music history. "Ms. Clark's research and analysis are insightful and innovative," says Dr. Joshua S. Duchan, Ms. Clark's advisor and Director of Graduate Studies in the Department of Music. "Her thesis is a great example of the fine work our graduate students do." The winner of the MAGS/ProQuest Distinguished Thesis Award will be presented at the MAGS annual meeting in Grand Rapids, Michigan, in April 2018. 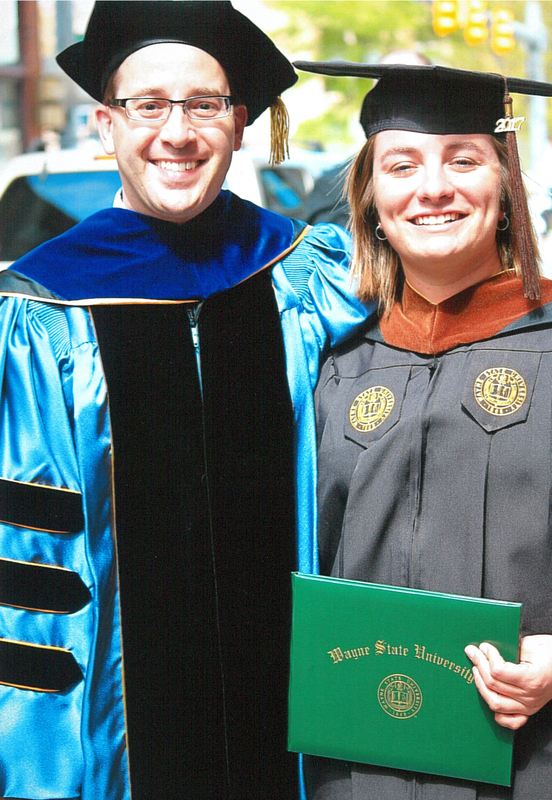 Photo: Jordan Clark (right) with Associate Professor Joshua S. Duchan at Wayne State University's Commencement, May 2017.